What support do i use?can i use the auto support from sp3d?what resolution?4mm? I used the standard support feature in Simplify3D back when it was version 3.0 don't no wha the difference is now in V4.2 but I guess it should be fine. I had a 4.0mm nozell at 0.2 20% infil and a 70% infil on the support so it was nice and strong, Cheers Jace. Using ABS although PLA should work too. The enard's solution is in this post? i really want to create one, can PLA handle it ? from what limited experience I've had with using PLA I would think you will be fine, Many others have succesfully printed it in PLA. After I printed this Toole part, I had to realize that the Spring System is missing. I first tried on the model itself to take the measurements, but then decided once online to look for the whole thing. I came across the original plans. I do not know how exactly the current model is on it, but someone can see if he can do something with it. I have seen Ednard's solution, but I think it's a not very nice option. May I ask which part did not work and especially how you created the tension? I just want the whole design to return to its original position without much tension behind it. I've reattached your blue prints out lining the pieces you need. Hi, we did these so long ago when Rob and I looked at this. The mechanisim wasnt going to be strong enough in printed plastic hence the video attached showing robs finished model as it working using fabricated metal parts the he had hand made himself. Is myminifactory the original? I need to reprint a single part and although your collection is great for simplifying the print, I don't want to print the whole thing for a single part. I'm not down on the collection. In fact the huge mass of parts help stabilize the print. This looks like a fun project and I'm just starting to print it. 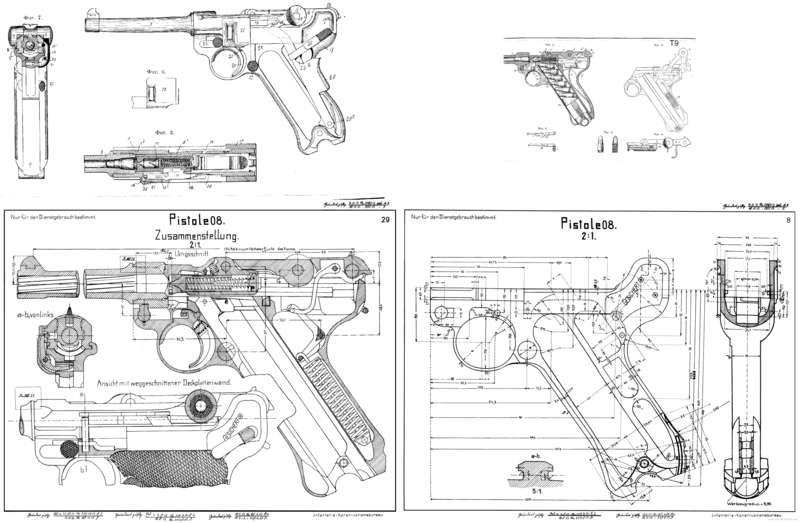 Does anyone have a link to an exploded view of the luger? W/o that, I'm probably going to struggle with all the little pieces. Okay, I have all the split parts but I don´t know how to assemble them to give my P08 any similarity with these amazing P08 that you have create . Could you tell me where I can find those instructions or give me ones? PD: I´m spanish so may be you find some gramatically mistakes in my text. Hi, could you upload all the parts separately please? I've printed a section with the barrel, and few parts have not printed soo good and I do not want to print the entire assembly again. Do you have the MG 42 model:? I modified the grips with different type of knurling. Hi, This is one of the most impressive models I have seen and I would like to print it. However, I am not sure that my print volume is big enough. Do you know if 4.7" x 4.7" x 4.7" (120 x 120 x 120 mm) is big enough to print the luger? Thanks again for this model it's really cool. Hi! Thanks a lot for this model. If I printed the NEW-03-P08-Luger_BODY, which of the other files do I need to print in order to assemble the gun and make it complete? Another Kiwi here - what is the purpose of the NEW-03-P08-Luger_BODY ? Do we print your original files part 1,2,3 to make it functionally slide reload? New -03-PO8Luger body was just a request from some one whom wanted it complete. Thats all! Can the mag ejection cartridges and is there a file for them? What is the best filament to print and paint this? Great model can wait to print this!! Yes the luger mag ejects and all the files are there. If your refering to the MP40 then you can get it from here. As for fillament I do everything in ABS so couldnt say if PLA is any good! I found a gunmetal paint in a spray can and then dry bushed siver here and there to give it a worn look. I have a stratsys f170 with dissolvable support material. Can I print this assembled? Have you remixed the files for the MP40 too? I printed from this https://www.thingiverse.com/thing:1038339 and it was really awkward and difficuilt as one piece. Thanks for the reply. Some of the parts don't fit are too long for even a 250mm print bed, that's why I asked. Oh I just use the free features in Windows 10 3DBuilder to split any file so it can fit on the printer. Hi, you could always check with Ednerd https://www.thingiverse.com/EDN3RD/makes as he made the addtional rubber band spring concept. Hi Jace sorry if I am bothering you just asking is the model scaled to fit in an average persons hand or do I need to scale it myself? thanks for taking your time to read my comment/ask! Hello Jace1969. I was wondering if you could make an assembly video because I would love to print and make this. Could u make a fully assembled version. If so that would be awesome. My printer bed is 200 mm by 200 mm and none of the sliced versions seem to fit on the bed. They all overlap just a little bit and I'm not using rafts or any platform adhesion type. Some of the pieces alone even seem to be too large to fit on the bed such as the two halves of the frame. Has anyone else had this problem? Hi The MadMaker, sorry no I've not experienced the problem you speak of. I placed the pieces to fit perfectly on my 200 x 200 platform and have printed several of these for friends and family with out issue. What are the small U-shapes that come with the receiver? I get that one is supposed to go on the back of the slide but otherwise I have no idea what the three others are for. I believe you are referring to the trigger. I had trouble standing it up as the we lugs on the side would snap off. So I split it in half. This project is perfect! I was just in doubt as to the position of printing, are all the pieces horizontal? The suports will not get in the way? I had the ABS support infill at 70% so it was nice and ridged and yes there is a small amount to chip away, but with ABS it just pulls away nicely. How the lock spring works? There aren't enough parts for a spring. I think it was an old pen spring. There is an app" https://play.google.com/store/apps/details?id=com.avidionmedia.iGunHD "you can get on your phone that shows all the different workings of a whole heap of guns. My mate RobV had made a couple of extra metal bits to get it to work more authentically, but I don't have those on file sorry! I just printed it on my Wanhao i3 and it is working damn fine. Thank you so much for the design. I am in the process of making mine at the moment. However, my print bed is quite small, so I had to use Meshmixer to separate parts. Thanks a lot once again. Im trying that now but cannot figure out how - can you give me any pointers? HOW IN THE HELL did you print the body?! No matter which way I orient it there are too many supports, and eventually the nozzle breaks some off, which bunches them up and creates a mess that destroys the print. how did you orient it with supports? if you still have the file with support structure, I'd love it!! I have printed 6 of these in ABS on my Wanhao I3 with out issue. File 3 I've splt the body into 3 components and used asertone to glue it together. I use a heated glass bed with 3 layers of PVA glue stick smeared evenly across the glass. 0.2 layer wit 50% fill and 70% support fill for better regitity. I use Simplify3D which dose a great job slicing these files ready to print. I have a wanhao i3 could you post it ? do you think that .2 mm layers would be fine and is pla to brittle? Hi Gav, yes .2mm layer height will be fine. PLA & ABS will both work fine also but both have there pros and cons. I find ABS stronger, easier to sand and a breeze to glue together with acetone. This model is cut up way to difficult. a lot less parts to glue. Is there any way to split the file with all the parts in to multiple different ones? I don't want to print a single file for over 11 hours so..
What kind of spring is that? Are there any other parts I should get? I think it was an old pen spring. There is an app" https://play.google.com/store/apps/details?id=com.avidionmedia.iGunHD "you can get on your phone that shows all the different workings of a whole heap of guns. My mate RobV had made a couple of extra bits to get it to work more authentically, but I don't have those on file sorry! could you please make another file where the whole thing is 2 prints but non functional so its just the 2 halves? If u read in the description you can down load it direct from the original owner as in pieces. You do realise you can also open all 3 files in Windows 3DBuilder and move, delete, manipulate, resize and reshape to your heart's content??? I've just simplified it so people can print it straight away! do you have to print all 3 of the p08 files to make it? and does it require supports at all? is the luger body the whole thing or just the lower frame? le plus beau pistolet pour moi. Jeez man! This is like the fourth upload in the last hour! You go fast with this kinda thing! Awesome! Full Replica PO8 luger by Jace1969 is licensed under the Creative Commons - Attribution - Non-Commercial - Share Alike license.